This is a set of 3 Black and White Minimalist Photographs. When I am out there and the subject is in front of my eyes, this is how I shoot. I take multiple shots from different angles. Later I pick one shot and post it here on my Minimalist Photography Blog. But today, I decided to post all 3 shots. I guess I posted a few Photo Series earlier as well. This one is actually a Mini Photo-Series comprising of only 3 photos. I earlier, did post a Photo-Series comprising of 30 photos in one of my Mobile Photography Series. OK, I must also mention that I nearly misplaced these set of photographs after I upgraded to a new camera. I recently upgraded my Camera from Canon EOS 600D (crop sensor) to Canon EOS 6D Mark - II (full frame) Camera. These photos were lying in the abandoned 600D Camera. Actually, its monsoon time and this Sunday I wanted to shoot some Water Droplets Macro Shots. I remembered I had captured some decent shots from my old 600D Camera with the 100mm Canon L Series Macro Lens mounted on it. So, I thought lets put the 100 mm Macro Lens on both, the Crop-Sensor and the Full-Frame Camera and see the difference in images captured. So, I captured some raindrops on the Lotus Leaves of my garden and compared the results. The photo quality was nearly identical and the only difference was, that I could get closer to my subject on the 600D. The reason was that Crop-Sensor Cameras have a Crop Factor of 1.6 and my 100 mm Lens therefore acted as a 160 mm lens. While I was transferring the water droplet photos from the old camera to my computer, I also found my last shoot that I did with it on January 7, 2018. I had not transferred them to my computed in 6 months. Wow, that's probably the longest time I have kept photos on a memory card without transferring them to my computer. 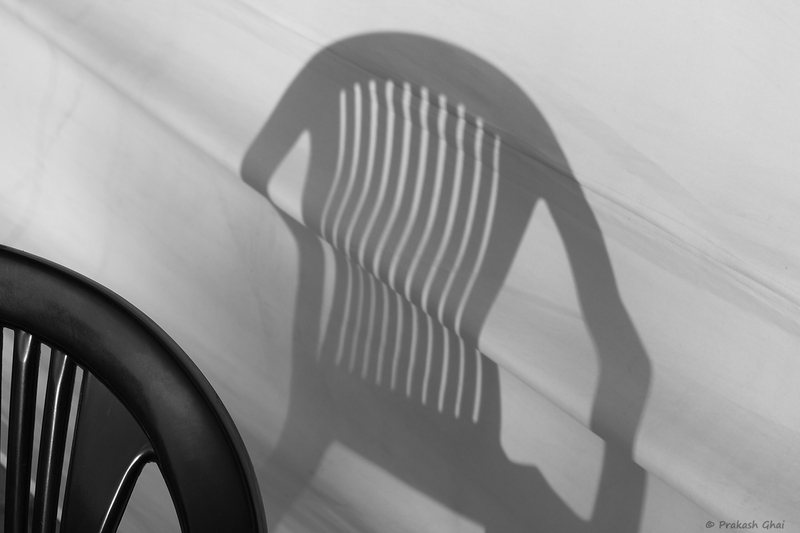 NOW, that I had the photos transferred, I edited one Photograph of the Plastic Chair Shadow to begin with and I thought that would be the only one I would post today. 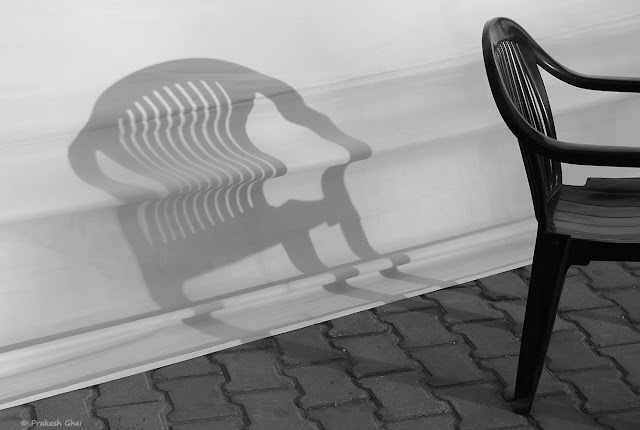 But Since the Subject "Chair" is close to my heart and also "Black and White" and "Light and Shadows", as well, I thought let me rather post a Mini-Series this time. This Plastic Chair was spotted at Jawahar Kala Kendra, Fair Area ,where they have made a Village replica with Old Style Mud houses. There was a Craft Exhibition that day and I was there with another Photographer friend of mine. While he was busy shooting Street Photography, my eyes were glued to this shadow. As you can see in Photo No. (2) my intention was to shoot "Parts of the Whole Minimalism"
The other shots I usually take as extra shots or practice shots or shots that I can post elsewhere. The first two shots are taken from side angles and the 3rd shot is a little top-downish. The intent in the 2nd and the 3rd shot is to create some imagination / mystery. I do so as I shoot only on Sundays as that's my holiday from work and because I always Shoot in the Full Manual Camera Mode. So, If I mess up the Expsoure or some settings, I have the RAW file to correct that. I don't have the liberty to go to the same place and I Can't shoot the same stuff as well, especially when it's Light and Shadow. Light and Shadow is natures play, once its gone its gone. Its never going to be the same again the next time. 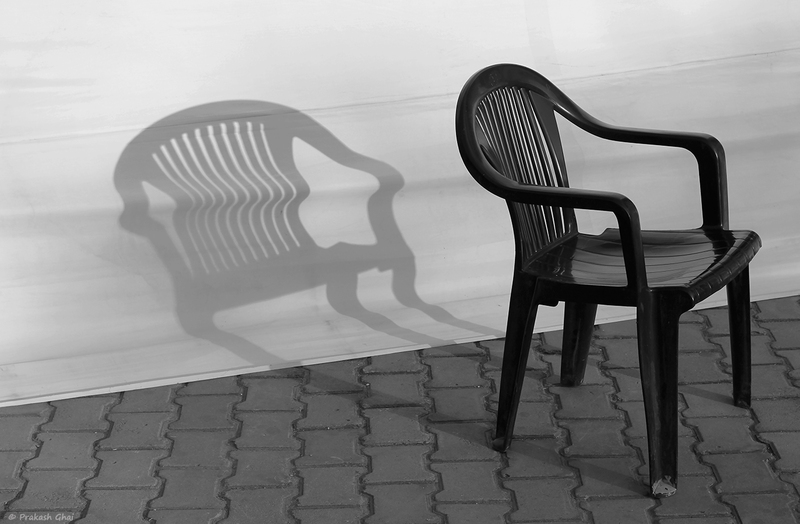 Hope you enjoyed the 3 Photo Black and White Chair Shadow Minimalism Photo Series.